You will recall the Remembrance Day Competition. There were three ‘winners’ – Mike Barton, Gerry Law and Ivor Rich. We asked them to nominate a Memorial where they would like us to place a wreath on their behalf and that of the Fight4thePJM Team and supporters. This is the second of the Remembrance ceremonies. 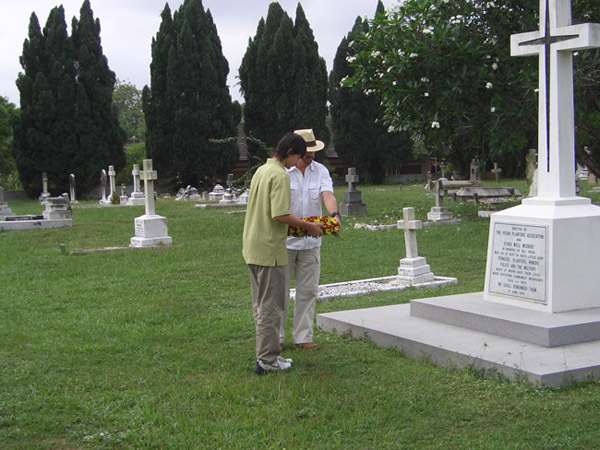 Gerry Law asked for a wreath to be placed in God’s Little Acre – the cemetery and memorial that is so special to all those who served or lived in Malaysia. For the first winner, we were able to call on a Fight4thePJM team member in Australia who asked a relative in Holland to do the honours. This time we asked another of the lead team, who lives in Scotland, to help us achieve Gerry’s wishes. He in turn asked a relative in Kuala Lumpur if he could ‘do the honours’. Unhesitatingly, that relative, Peter Nicoll, did ‘do the honours’ and he has just sent in a report and images of this very moving occasion. 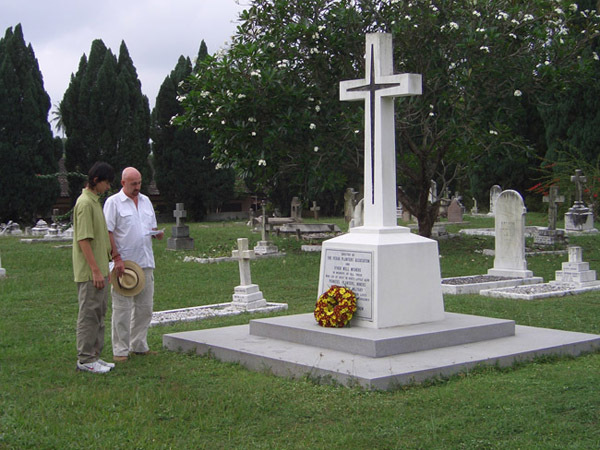 I think you will agree that what Peter and his family have done reflects the astonishing sense of ‘togetherness’ and camaraderie and remembrance that exists down generations and between all those touched by the Pingat Jasa Malaysia and all that it stands for. As promised, the wreath laying ceremony was conducted today. Accompanied by my thirteen year old son, Callum, and my good lady wife Oi Man, we left Kuala Lumpur early this morning, arriving at Batu Gajah around 0845am. This is actually quite an auspicious day, as we were met by a Hindu Procession from the local temple celebrating one of the Hindu festivals. It is also the Chinese ‘Ching Ming’ festival, where families visit the graves of their ancestors to pay annual respects. I had forgotten about this, but was reminded by my wife!! I am attaching a note on the few words I said after the laying of the wreath. I felt it appropriate to say a little something. 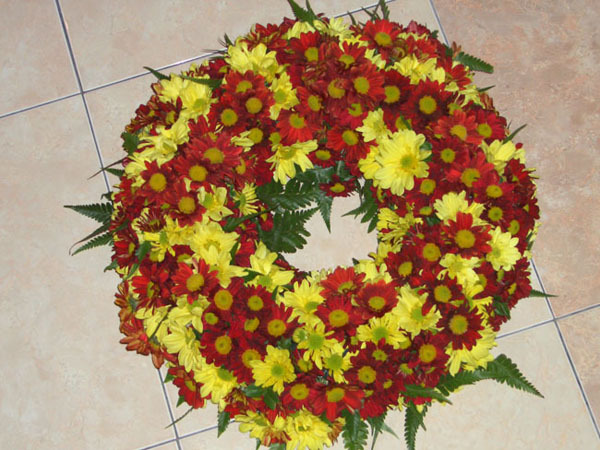 The wreath itself I had made in two colours, red being the normal Remembrance colour and yellow to signify the national colour of Malaysia. It was laid with due respect and decorum at the Cross of Remembrance in the centre of the cemetery. During the laying ceremony I was approached by a young Indian/Malay girl and her mother and discovered that she was the Granddaughter of the former Police Officer who rescued and now maintains Gods Little Acre. I explained the significance of what we were doing and asked her to take a photograph together with my son Callum, and by doing do so representing not only the British Veterans (Callum), but through her, also the Malaysian Veterans. 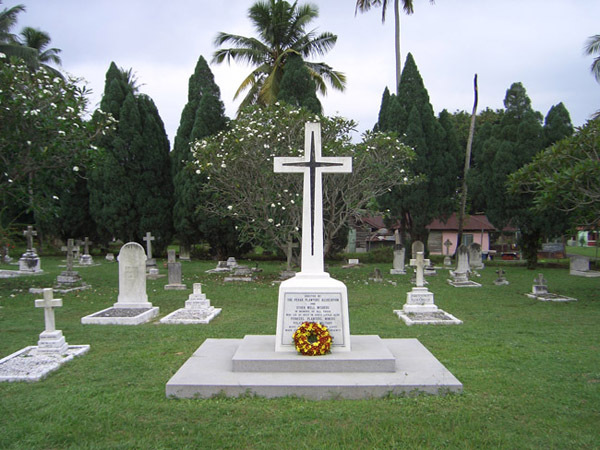 I have also forwarded to you a photo of the graves of Walker, Allison and Christian, the three planters whose murder on 16 th June 1948 precipitated the Malayan Emergency. 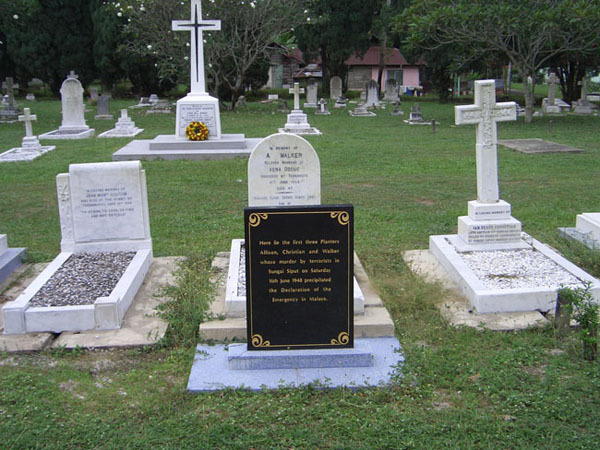 They are interred in Batu Gajah. I am attaching two separate files, on two separate e-mails with photos for your perusal. The files were large, hence the reason I have split them into two lots. Please let me know that you receive them. From Callum, Oi Man and I, our best wishes, and our gratitude for allowing us the honour and privilege of laying the wreath. Here are the words that Peter said after the wreath had been laid. The images of this special Act of Remembrance follow. 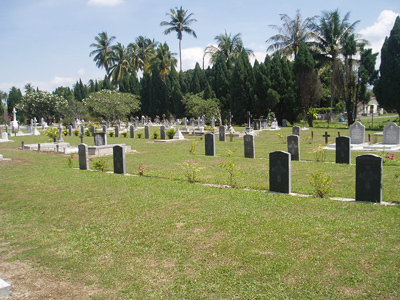 "This cemetery at Batu Gajah, Perak, Malaysia, is the final resting place of many, many brave souls, who have made the ultimate sacrifice for freedom, their Sovereign and their country. 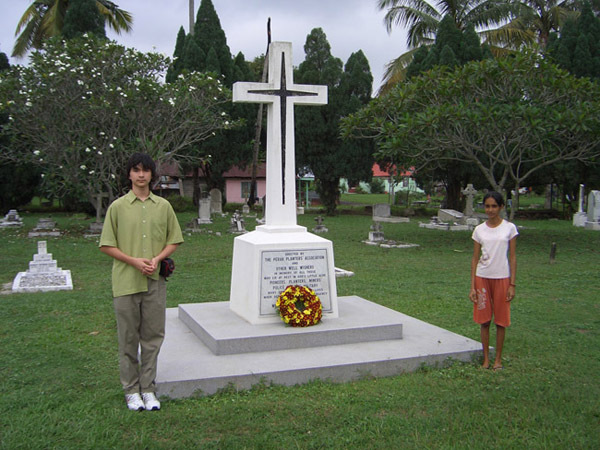 519 lie in Malaysian soil in places of remembrance all across this foreign land, a poignant reminder to all generations of the commitment that young people from across the commonwealth made to the advancement and freedom of this wonderful country. 115 of the 519 brave are interred here at Batu Gajah. Those interred here served with honour in the 4th Queens Own Hussars, Royal Regiment of Artillery, 2nd Bn The Coldstream Guards, The Somerset Light Infantry (Prince Alberts), The Green Howards (Alexandra Princess of Wales Own Yorkshire Regiment), The Worcestershire Regiment, The Kings Own Yorkshire Light Infantry, The 6 th Queen Elizabeths Own Ghurkha Rifles, The 7th Duke of Edinburghs Own Ghurkha Rifles, Royal Army Medical Corps, Corps of Royal Electrical and Mechanical Engineers, 42 Commando, 45 Commando, Royal Air Force 84 Squadron. 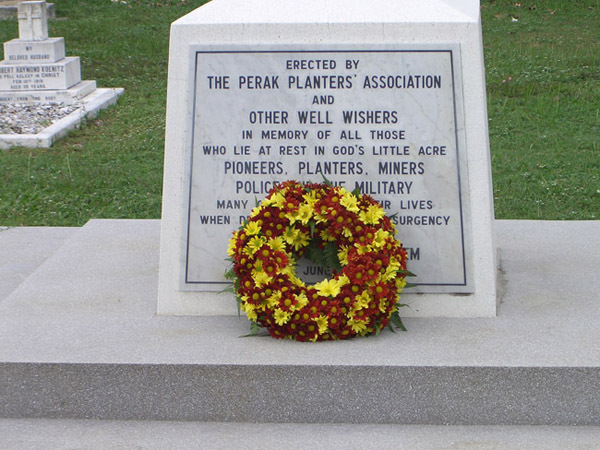 Apart from Commonwealth military service personnel at rest here, there also 13 civilian planters, 9 civilian miners, 6 other civilians, and members of the Federation of Malay Police, The Perak Area Aboriginal Constabulary and the Malaysian Sarawak Rangers. Today, we as a family, are privileged and honoured to lay a Memorial Wreath on behalf of Mr. Gerry Law and all members of the Fight4thePJM Association, in memory of all interred here. We also hope, that this tribute be accepted, with our deepest respect, by the families of those we remember here today. Here are the images of this very moving act of remembrance. "The wreath itself I had made in two colours, red being the normal Remembrance colour and yellow to signify the national colour of Malaysia." "I am attaching a note on the few words I said after the laying of the wreath. I felt it appropriate to say a little something." "During the laying ceremony I was approached by a young Indian/Malay girl and her mother and discovered that she was the Granddaughter of the former Police Officer who rescued and now maintains Gods Little Acre. I explained the significance of what we were doing and asked her to take a photograph together with my son Callum, and by doing do so representing not only the British Veterans (Callum), but through her, also the Malaysian Veterans." 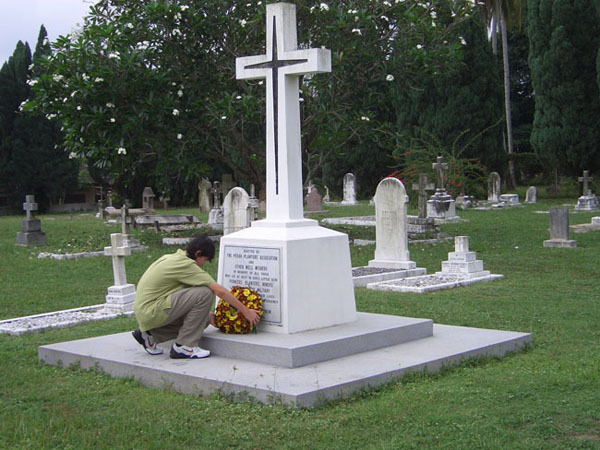 "Here lie the first three Planters Allison, Christian and Walker whose murder by terrorists in Sungai Siput on Saturday 16th June 1948 precipitated the Declaration of the Emergency in Malaya"
Comment: Carol and I have just looked at the images and we were both very touched. If I achieve nothing else in this Campaign to right the wrong of the HD Committee's crass decision, to have been involved in some small way in this Act of Remembrance will have justified all the effort. It's a shameful indictment on this once proud nation that the courage and sacrifice represented by those graves is not matched by an appropriate level of humility and understanding by those in Whitehall. Many thanks to all who made it happen. Comment: A wonderful ceremony. It reflects on all those involved in running this campaign and who made this wish come true. Their 'hearts and minds' are in the right place and they are an example to those in government and to those civil servants who have no understanding of the meaning of what is behind acts of remembrance like this. I do not want to politicise this deeply moving and solemn event but this needs to be said. I was prompted to comment by the picture of Thambipillay Rajasingam's daughter. I think it was her grandfather who helped restore the graves and cemetery in God's Little Acre and it was the Australians who didn't hesitate to honour him for his work while the British government sat on their thumbs sucking their dummies. Then there is Callum. Our future will rest in the hands of young people like him. What does he make of it all when he hears about what is happening to the PJM? Roll on the May 3rd elections in Scotland! Comment: What a lovely ceremony. It was a nice thought to include the two youngsters in the photo. They are the future of both countries. Comment: Moved to tears, and so proud to have done my bit to help such a wonderful people.